Archbishop Claudio Gugerotti was born in Verona, Italy on 7 October 1955. He was ordained a priest on 29 May 1982 as a member of the clergy of Verona and the Society of Fr. Nicola Mazza. He earned a Doctorate in Oriental Languages and Literature (University of Venice-Ca’ Foscari), a Doctorate in Eastern Church Studies (Pontifical Oriental Institute, Rome) and possesses a Licentiate in Sacred Liturgy (Santa Giustina Institute, a part of the Pontifical Athenaeum of St. Anselm). He was a lecturer in Patrology at the Theological Institute of St. Zeno in Verona from 1981-1984. He lectured in Oriental Theology and Liturgy at the Institute of Ecumenical Studies in Verona from 1982 to 1985, at the Santa Giustina Liturgical Institute in Padua and at the Pontifical Gregorian University, Rome. He lectured in Oriental Languages and Literatures at the State Universities of Venice, Padua, and Rome and in the Pontifical Oriental Institute, Rome. He entered the service of the Holy See in the Congregation for Oriental Churches in 1985, being promoted to Under-Secretary of the Congregation on 17 December 1997. He was for 11 years a Consultor to the Office for the Liturgical Celebrations of the Roman Pontiff. He authored various publications about Oriental studies. He has mastered a number of ancient and modern languages: Greek, Latin, Armenian (classical and modern), Persian, English, French and Russian. His first assignment as head of a diplomatic mission was as Apostolic Nuncio in Georgia and Armenia on 7 December 2001. He was named Apostolic Nuncio in Azerbaijan on 13 December 2001. 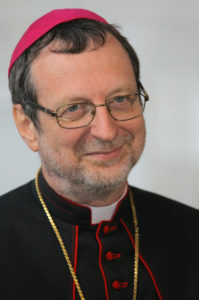 He was named Apostolic Nuncio in Belarus on 15 July 2011. He was named Apostolic Nuncio in Ukraine on 13 November 2015. A precious Crucifix given to the Holy Father in thanksgiving for His aid to the Ukrainian people.